Sometimes you have a wine that's good, and sometimes you have a wine that really grabs your attention. But when that wine costs less than twenty bucks, it gets in your face and squeezes your cheeks like an obnoxious aunt. That recent one for me is a Pecorino from Le Marche that my partner in wine crime, Do Bianchi (a.k.a. Jeremy Parzen) brought to me from a store in California. The producer is Clara Marcelli, and it's called Irata from the Offida D.O.C. Pecorino is a white varietal which is indigenous to Le Marche. It is, however, found all over central Italy. The origin of the name comes from pecora, which means sheep, and the -ino at the end is a diminutive. Pecorino, apparently, was the preferred snack of some very lucky sheep indeed. I love a good story about a forgotten varietal (Italy is full of them! ), abandoned to be found growing wild in someone's backyard. 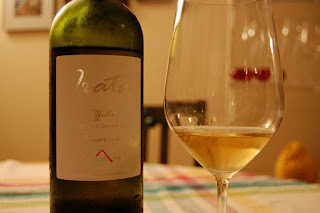 Pecorino has such a history, rediscovered as it was almost 10 years ago. As for the wine, its color is a very golden yellow (only a 2007, must be characteristic of this varietal), and the nose is rich with gingered mustard, beeswax, Meyer lemon, spice, and totally savory minerality. It is this last trait, in fact, that makes this wine so incredibly addictive. It functions very much like the burst of pineapple acidity on an Al Pastor taco, or the squeeze of lime on a fish taco...oh, now you know what I mean! Italy has a uniquely fascinating wealth of indigenous varietals. There is always more to discover if we can get away from the Cabernet-ed, Merlot-ed "Supers." Often, wines made from autocthonous grapes represent some of the best values around, and if you're game for an adventure, this is a great place to start. Welcome back. Wished you think about doing a Texas wine segment. Glad you are posting, dear! 2B--thanks jeremy p, nice to have fans like you! Weekly Wino!!!! Hmmmmm!!! that does mean weeeeeeeeekly. Hmmmmmm!!! Wouldn't it be nice if weekly meant weekly. Somehow weekly must have been translated in Italian to semi yearly and being back in Austin hasn't caught up with the Texan version of 52 weeks in a year. The weekly version would be great. Loved you and Jeremy's visit with us for Christmas. Have a blessed New Year and I expect somethin' to be cookin that was made with that new mixer/doitallthingamajiggy you got for Christmas. I like Pecorino and the wine you mentioned is a winner. I didn't know that it grows all over Italy though, I though it was specifically Marche related. Thanks for the info. hi susannah, thanks for stopping by! i know it is specific to le marche/abruzzo, and indigenous to the former, but like everything else (in surely unimportant quantities), it can be found sprinkled over other parts of the peninsula, according to all sources.